We are profoundly disturbed by news from Habitat International Coalition’s Housing and Land Right Network (HLRN) and local Palestinian organisations about the evictions, impending orders, and mass land expropriation against the residents of the occupied Palestinian territory. The State of Israel and, by extension, its parastatal organizations, the World Zionist Organization (WZO) and Jewish National Fund (JNF), bear the duty to uphold norms of applicable international humanitarian and human rights law as minimum guidelines for their treatment of the indigenous Palestinian civilian population, including refugees. The State has assumed these duties, including by way of its treaty ratifications and affirmations mentioned below. By extension, compliance with these rules also is required of private parties to avoid contributing to the situation that leads to certain violations. The recent land expropriations and demolitions in the villages of Tubas, al-Hadidya, al-Aqaba, and al-Nu’man, simultaneously have produced the most-recent victims and are of international concern. In addition, the continuous violations against the Jahalin Bedouin, as a result of both the E1 plan, the Wall construction, and the new Jewish settlement in <?xml:namespace prefix = st1 ns = "urn:schemas-microsoft-com:office:smarttags" />East Jerusalem highlight a particular need for attention from the Israeli government to ensure protection for this vulnerable group. Specifically, the Israeli authorities have breached their treaty obligations under the International Covenant on Economic, Social and Cultural Rights (ICESCR), which Israel ratified on 3 January 1992. The State has been derelict in its obligations as elaborated in the UN Committee on Economic, Social and Cultural Rights General Comments Nos. 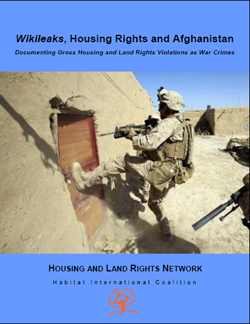 4 and 7 on the human right to adequate housing, including protection from forced eviction. Israel also has been specifically condemned by the Committee reviewing the Convention against Torture at the end of 2001, when recognising for the first time house demolition as a form of cruel, inhuman and degrading treatment and/or punishment. Israel ratified CAT on 2 November 1991. The State flagrantly breaches its obligations, inter alia, under the International Covenant for the Elimination of Racial Discrimination (ICERD), both in general and specifically Article 5(e)(iii), which treaty it ratified on 2 February 1979. Also, it is worth noting that the 1998 Rome Statute of the International Criminal Court defines both “population transfer” (art. 7(1)(d) and 7(2)(d)) and the “extensive destruction and appropriation of property, not justified by military necessity and carried out unlawfully and wantonly” as war crime (art. 8, 2.a (iv)). We call on you to carry out your duty within the norms and standards required of States. We thank you in advance for your attention to this matter and look forward to hearing from you about your remedial response.